The most difficult cases that we handle are wrongful death ones. Losing a loved one through the negligence or malice of someone else is awful. There’s no amount of money that can ever make up for losing someone you loved. Wrongful death lawsuits award damages and compensation to survivors of the deceased. Again, while this money can never make up for the loss, it can help. This compensation can assist with the transaction to the next phase of a person’s life. In this blog, we’ll go over what a wrongful death attorney in Los Angeles from our firm does and how they can help. There is some question about when and where wrongful death suits are applicable. To be clear, one time that wrongful death suits can get quite complicated is when a person passes away while on the job. In that case, the survivors of the deceased should seek out a workers compensation attorney, as they can assist with cases when the deceased passes while doing their job. In all other cases where someone passes away through the fault of another, a wrongful death lawyer could assist. To be clear on what a “wrongful death” is, it’s when someone is killed through either an international harmful act or negligence. A wrongful death suit is very different from a murder one, for example. Perhaps the most famous example of a wrongful death suit in American history is when OJ Simpson was sued. To be clear, this was after he was exonerated on the murder charges against Ronald Goldman and Nicole Brown Simpson. If you believe that your loved one was killed through the intentional act of another, we strongly recommend that you reach out to our wrongful death lawyer team. Negligence is the other case in which wrongful death applies. When someone’s negligence causes your loved one to pass away, you can receive damages for this. There are many examples of negligence leading to someone’s passing: a vehicular accident, where the other driver wasn’t paying attention. Another is medical malpractice: your loved one went into a hospital for care and their death resulted through the carelessness of the medical staff. It could even be something like your loved one was shopping in a store, lean on a handrail, and the handrail gave out. Wrongful death can be the result of essentially any personal injury. We understand that this all can be quite a bit confusing. Moreover, when you’re trying to learn about it, you’re also dealing with the grief that comes from losing someone you care about. That’s just one of the many reasons that we offer free consultations. Should you believe that your loved one passed away through the negligence or international actions of someone else, don’t delay. These cases do have deadlines, and you want to get started with a wrongful death case as soon as possible. As our cases are free, there’s no real downside to reaching out to schedule a meeting. The law is very strict about who can file these kinds of lawsuits. Typically, we’re approached by those who represent the deceased’s estate. Minors can receive compensation from the passing of their parents, and parents can receive compensation should their children have passed away. 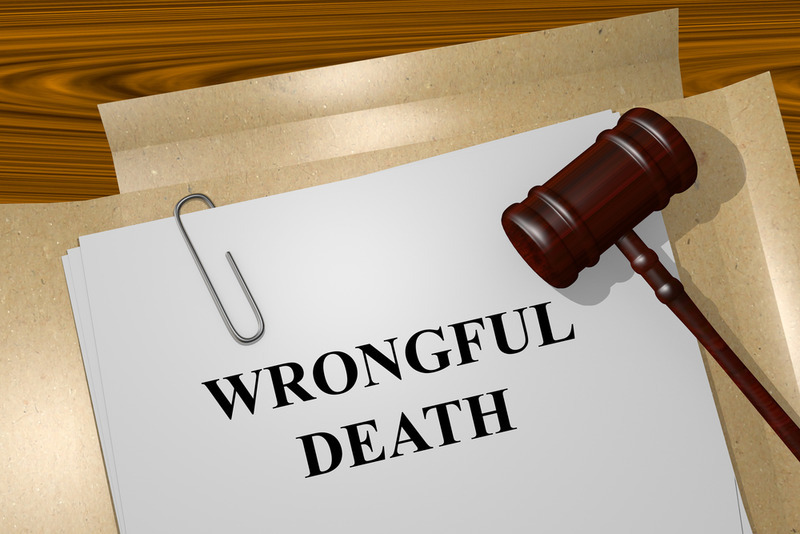 If you were married to the deceased, you can file for a wrongful death law suit. Beyond that, there are some question marks. If you believe that you have a wrongful death lawsuit and you aren’t the deceased’s spouse, parent or child, we strongly recommend that you reach out to us for a consultation. We’ll figure out the best way to help you forward with your wrongful death suit. That being said, we always also recommend that prospective clients reach out to a wrongful death lawyer who actually has experience with wrongful death cases. These cases aren’t like other cases. They’re certainly quite different from personal injury cases. However, too many law firms will simply push their personal injury attorneys onto these cases. You and your loved one deserve to have an attorney with experience in this kind of case. Here at the LA Injury Group, we have several attorneys with years of wrongful death experience. They’re helped countless families to receive compensation after the passing of a loved one. By having an experienced wrongful death lawyer at your side, you give yourself one less thing to worry about during an exceptionally trying time. The grieving process is hard enough. Trying to balance grief with pursuing a wrongful death lawsuit on your own is essentially impossible. Hiring an experienced wrongful death lawyer can help to give you space. We can’t say enough how no amount of financial compensation ever makes up for losing someone that you love. As your wrongful death lawyers, we do everything we can to make sure that you receive as much compensation as possible. That can help with a variety of bills, as well as make the transition to the next phase of your life just a tiny bit easier. For example, we often receive damages for the funeral and burial costs of your loved one. You shouldn’t have to pay those if your loved one passed away due to the negligence or international act of else. Many medical bills can be included in this as well. Should your loved one have accrued medical costs due to the injury but before they passed away, you can receive compensation for those. One particular kind of claim that you can file in a wrongful death case is called a “survival claim.” This claim covers your loved one’s pre-death pain and suffering. Should they have suffered in any way, you deserve to be compensated for it. We understand that this isn’t easy to think about. That’s why we’re always there with you, by your side every step of the way. If your loved one was still working, they would have been able to continue providing financially. We can help you to receive damages for their expected income, the money they would have made. By that same token, should their passing in any way lessen or reduce your inheritance, we can assist you in filing for those damages as well. When you lose money that you expected to make due to the actions of someone else leading to the passing of a loved one, we can be there to make sure you get the right compensation. Love, companionship, guidance, nurturing and care – those are all things that the deceased provided to you, and would have continued providing. You can file for those as well. Many of our clients find this hard to believe, but you can file for damages for losing out on the love and companionship of someone. You can also file for what’s called “loss of consortium.” This may sound a bit confusing, but the idea is that when you lose someone who provided you with comfort, companionship, affection, love or even sexual relations, you deserve to be compensated for it. That’s what these damages are all about. The above contains quite a bit of information. We understand that some of it may be difficult to parse. Moreover, it can be especially difficult to parse when you’re going through the loss of a loved one. That’s where our risk free initial consultations come in. When you’re ready, we’re here to talk to you. When you call us, you’ll sit down with some of our trained professionals, but it’s very informal. We may ask you several questions, we might not, but at the end of it, we’ll explain how we can best help you through your difficult case. To begin the process, give us a call at (818) 210-4558.